In the last decades of twentieth century, the relationship between composition and technology took a new and ever-changing path. The versatility of the digital domain, supported by an exponential growth of the computational power, has led to the development of a large amount of computer tools (e.g. computer aided composition, sound synthesis) and sound recording systems. This has resulted in a proliferation of heterogeneous sources. Studying this repertoire can be challenging: the obsolescence of reading systems and hardware/software environments poses a problem in terms of access and recognition of the sources. If extended to the secondary sources, this condition also involves analytical aspects: patches, libraries and software, along with traditional sketches and drafts, are of paramount importance for the comprehension of the creative process. 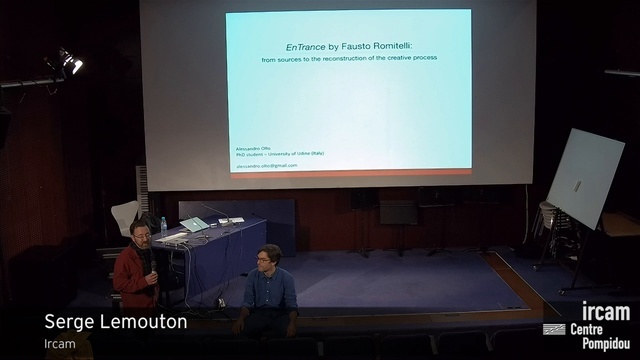 EnTrance (1995) by Fausto Romitelli, composed at IRCAM with the musical assistance of Laurent Pottier, serves as a case study. It is a mixed music composition for ensemble, soprano and electronics. The talk will seek to highlight the creative process of the work, starting from the sources preserved at the IRCAM production department and from the information given by Laurent Pottier. The attention will be focused on some composition techniques and on the interconnections between two different musical writing forms (the score and the electronic part), providing a sample of analysis of the work. Finally, an example of regeneration of the electronic part from its single constituent parts will be proposed.